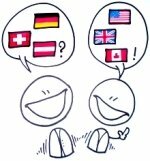 This is the New Zealand page for German language courses and translation qualifications, part of our German to English Translation Online Directory. With only a population of a little over 4 million, New Zealand isn’t backward in its German language course provision! Indeed, several universities in New Zealand stress the importance of relations with Germany, especially in the tourism industry. Both Germans and New Zealanders, apparently, love travelling, and Germans are keen New Zealand tourists! Although Germany and other German-speaking European countries are geographically distant from New Zealand, the German Academic Exchange Service (DAAD –Deutscher Akademischer Austausch Dienst, www.daad.de) is very active. For German-language related university courses, DAAD helps in finding placements at German universities and providing scholarships, for advanced students, scientists and academics. The NZSTI (www.nzsti.org), the New Zealand Society of Translators and Interpreters, is the national body representing the translation profession in New Zealand. They formally recognise some of the translation courses offered by universities in New Zealand (courses marked below) and offer full membership or affiliate status based on the pass mark achieved in the course. Have YOU studied on one of the German language courses listed here? Tell us what you thought of the course. Helpful entries will be rewarded with a link to your website! New Zealand’s newest university, its School of Languages and Cultures offers several translation-related degree courses. However, a word of warning - I couldn’t find the word “German” (or any other language, for that matter) anywhere on the site! The Diploma in Interpreting and Translation is designed to be part time, taken over 2 years, and is aimed at professional interpreters and translators. Candidates will be expected to have studied their second language at tertiary, i.e. university, level. The MA in Applied Language Studies is designed for graduates of English and other languages. Students specialise in one of a range of subject areas, and the choice of specialism includes both translation and interpreting. You can find out more about studying in New Zealand here. Unfortunately, although it’s great for German, Canterbury doesn’t appear to offer courses in translation. European and Latin Amerian Studies, School of Linguistics and International Languages. This is a bit of a non-entry for German language courses: the Massey website states that there are no new enrolments for German as a minor from 2011 onwards, but there are papers available for intermediate and advanced German. Quite where that leaves students wishing to start off with German as their minor in the Bachelor of Communication in International Language, I don’t know. Contact Massey directly. The Interpreting New Zealand Service is a not-for-profit organisation running interpreting services for New Zealand’s population. They offer German –language interpreting services, as well as in-house training for becoming an interpreter with the organisation. Do you know of any other institutions running similar German language courses and translation degrees in New Zealand which are not on this list? Then please let us know. And don't forget, if you've studied at one of the institutions on this pages, tell us about your experiences and we'll reward you with a link. Thank you!